Twitter is one of the most important tools available. 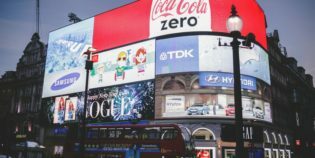 Like it or not, the platform has changed the foundation of consumer interaction and has taken center stage amongst other social media communities. The extremely public platform makes it easy for anyone to access, and using the social network strategically can immediately expand your overall business outreach. However, understanding how it all works can be somewhat confusing. And in today’s competitive world of business, it’s necessary to figure out what methods work best for your business and brand. Twitter can quickly become an essential part of your marketing strategy if you know how to use it. The first thing to learn is exactly how it’s all calculated. 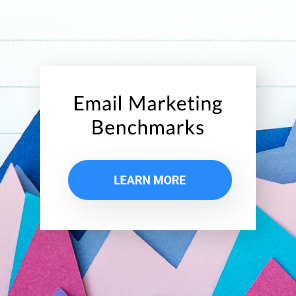 There are four main elements that are added together during a given report period when measuring your engagement results. A direct @reply is when a user tweets by using your handle at the beginning of their tweet (shown above). If a follower shares your message this is called a retweet (shown above). This is when a user includes your brand handle, but not as a direct @reply (shown above). When a user clicks the heart icon or like button on any of your posts. The following will better explain the process and offer 8 ways to reach better results. 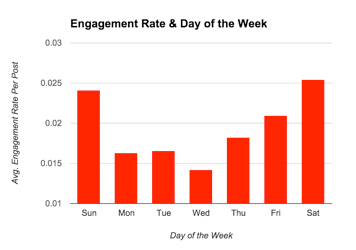 Most social media engagement happens around noon on the weekends. These are considered peak tweeting days. However, you should also understand this is an average. Twitter is a worldwide community and people are connected at all times of the day. Research your followers and discover what times they’re viewing. According to research published on bufferblog.com, Tweets that got the highest engagement were published on Saturday and Sunday. 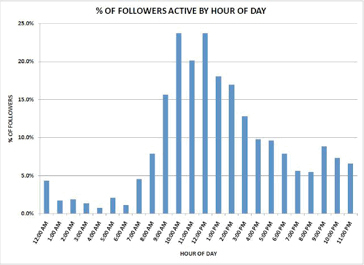 The peak times vary, but the average shows that the highest engagement seems to be around noon, where the percentage of active followers increases up to 25%. Of course, this depends on the country you live in and the country of your target audience. Your tweets must be creative and intriguing. The message needs to reflect the interest of your brand and that of your audience. Know your target demographic and offer them a variety of media, such as links, photos, and videos. Do your research and remain true to your brand’s mission and your viewpoints. One of the most retweeted Tweets of all time was in all form and shape honest and simple. Take a look at how Harry Styles took Twitter by a storm with a simple, yet relatable Tweet. 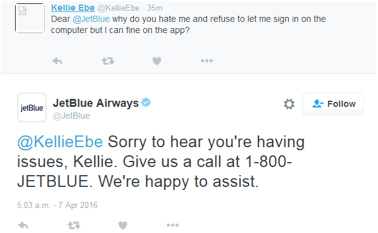 JetBlue Airways found a way to interact with their fans, and rake in a good amount of traffic at the same time. Their genuine response to one of their followers Tweets caught a lot of attention due to the laid back tone of the Tweet itself. Twitter has a character limit that may seem fairly short already. However, you should ideally be able to communicate within their set limitations (100-140 characters). The shorter tweets receive higher engagement numbers overall and people want information fast when browsing social media and communicating via the Internet. To build your community you have to tweet consistently. Twitter is made for quick and repeated interaction, so post at least a few times per day to establish a solid presence. Scheduling tweets is helpful and can be done with various tools (see “Additional Tools” below). And never be afraid to ask for retweets. You will need to discover a process that helps you better narrow your focus and manage your tweeting. Scheduling content is an excellent way to stay on top of the post load and can be imperative to your overall productivity. The more organized you are with your tweeting, the more you and your twitter account can accomplish. Do not be scared to ask followers for retweets. It’s normal for companies and brands to do so now. And it is often a big missed opportunity among companies and brands that think it may be too pushy. Even if it’s just one, the retweet has already upped your engagement. Before you go ahead and ask for a retweet make sure to give your followers a good reason for why they should share your Tweet. Whether it’s because the content you’re offering is amazing, or you’re offering a prize of some sort, it has to be appealing to them. This is not only a great way to generate traffic but gain brand advocates that are going to promote your brand. 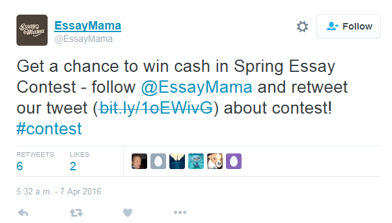 Here is EssayMama example. Hashtags are proven to double your engagement rate and are their own call to action element. They will create higher visibility, but should be limited to 3 hashtags or less per post. You do not want to overwhelm your followers with an entire message full of hashtags. Find focused and trending tags and use them according to your already creative content. 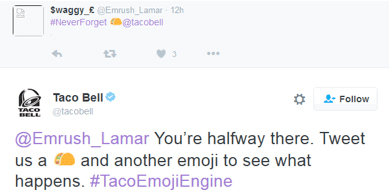 Taco Bell drive their Twitter engagement through the roof, by engaging with their followers and using a light-hearted tone, combined with a trending hashtag. This maximized their brands mentions and retweets in a matter of hours. 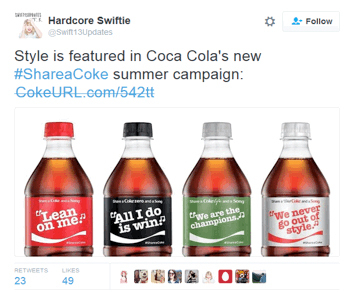 Coca Cola took this a step further and created their own hashtag that exploded the social media. Their followers were asked to Tweet their own stories with the hashtag #ShareaCoke. Most of Twitter engagement comes from clicking links. You will have to include them to truly reach optimum results. And tweets with links get up to 86% more retweets than those without. It’s simply a must have for any successful twitter marketing strategy. 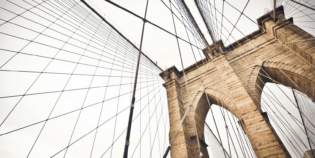 Without links, you will fail to understand the engagement process. Tweriod – This free tool analyzes users tweets and their followers tweets to discover at what time it makes the most sense to reach your audience. Klout – This tool has a business version that allows users to not only create better content and track their impact, but it also suggests content that your followers have not seen. 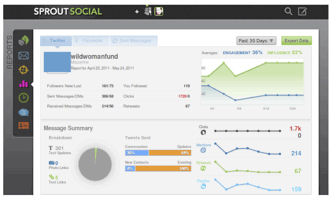 Sprout Social – This dashboard tool allows users to view multiple profiles from different social media platforms. It covers Facebook, Twitter, and Google+. And it also has unique metric measurements to help schedule impact across all social media platforms. 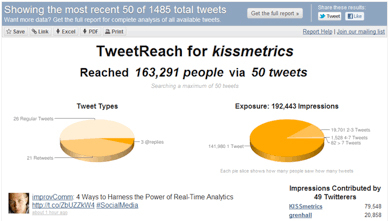 TweetReach – This free tool runs reports on other Twitter users in your niche. This offers users information they otherwise would not see. The results display a breakdown of the types of tweets they send, the number of impressions their tweets receive, and who the top people retweeting them are. TwitterCounter – This tool is useful for monitoring your follower count and better understanding your tweeting methods. 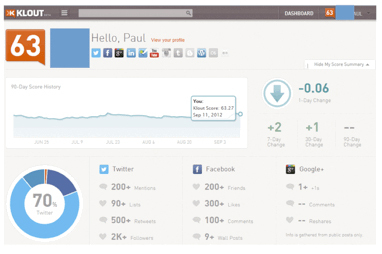 Users can access statistics about their brand’s followers and all of their tweets in an easy to read graph. And even predict how long it may take to double your current follower count using the prediction sliders. Commun.it – This twitter and Facebook community management tool is a great way to get a handle on the entire tweeting process. Users can access all of the necessary information including whom they are following, whom they should be following, and whom you don’t need to be following. 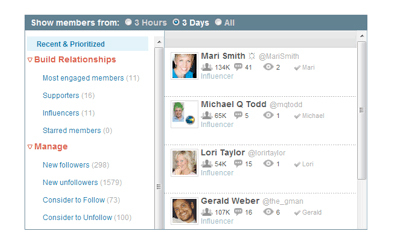 By showing users who the most influential tweeters are in a specific community or niche, the tool makes it easy for brands to better schedule and plan their posts. If your Twitter engagement is lacking, it’s likely something you can remedy. To enhance your overall reach and intrigue you will have to remember how results are measured, as well as the process of content creation. Use this guide as your constant checklist and personal tweeting aid. There are simple and easy changes you can start making today to increase your engagement. If you know how to tweet strategically, it can be a worthwhile investment for your brand’s marketing strategies. So good luck and happy tweeting!